Le Petit Marche: Lifestyle. Fashion. Fun. Another reason we’re looking forward to this long Democracy Day weekend? Le Petit Marche! Le Petit Marche is an indoor market (or flea market to some) that takes place the last Sunday of every month. This will be Farafina’s first time participating at Le Petit Marche however we just can’t believe it’s taken us this long! LPM is now permanently based at GET Arena and will be taking place this Sunday, May 30th, 2010 and it starts at 12pm. As always we are very much looking forward to meeting everyone there. Cam Cam Sweets – Confectionary!!! UK and Retro sweets (Haribo, Swizzels, Wham Bars , Sherbet etc). Sold in a variety of selection packs of 150g, &500g ranging from N800-N2,000. Home Essentials – We sell a wide range of home products such as vases, flowers, yankee candles, figurines and so on. We sell both wholesale and retail and we do party souvenirs for birthdays, weddings etc. Silk scarves (plain and embroidered); silk and cotton tunics & dresses; embroidered tablemats and throws; silk and cotton fabrics. We also sell Daviva brand of local Ankara fabric. and of course Farafina Books! We’re so excited about this upcoming weekend and for good reason! The wheels of Farafina Trust have been chugging extra time over the past one week as they (Farafina Trust is a sister organization) have been hosting their annual Creative Writing Workshop with Chimamanda Adichie. Several award-winning and celebrated African writers are indeed in Lagos to help facilitate this workshop. These are Adaobi Nwaubani, Binyavanga Wainaina, Chika Unigwe, Niq Mhlongo, Ama Ata Aidoo, and Sade Adeniran. Well, all the hard work has been done and now it’s time for the finale party. This is where Farafina Books, of course, loves to join in the fun! 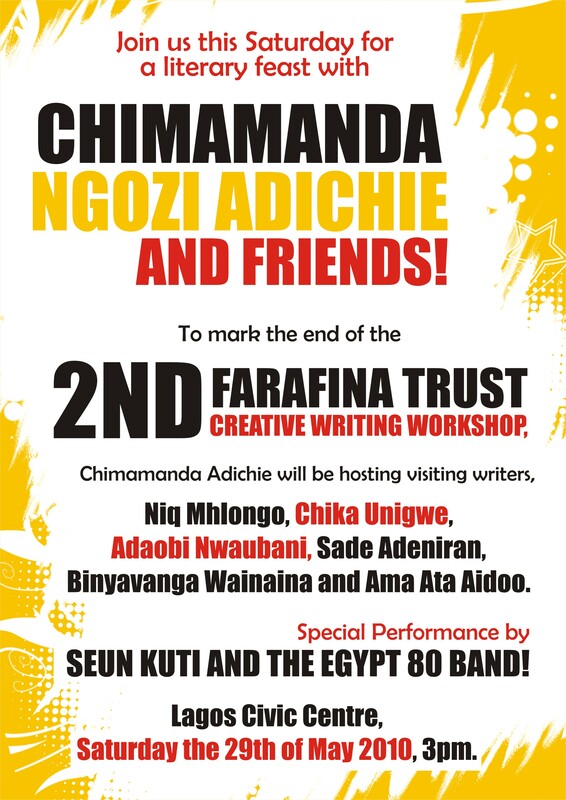 To celebrate the end of the 2nd Farafina Trust Creative Writing Workshop, Chimamanda Adichie will be fete-ing the visiting writers, and Commonwealth Prize Winners, Adaobi Nwaubani, author of I Do Not Come to You by Chance, and Sade Adeniran, author of Imagine This, will also be reading from their work. Seun Kuti and the Egypt 80 band will also be performing live! Be there or be….square! (for lack of a better phrase). If you haven’t had a chance to attend the lovely monthly series “BookJam @ Silverbird” well, you’re lucky as another wonderful edition is right at your doorstep. This event is for anyone who’s an avid reader and supporter of African Literature, as it gives a rare opportunity to meet a selection of writers every month. You really don’t want to miss it. 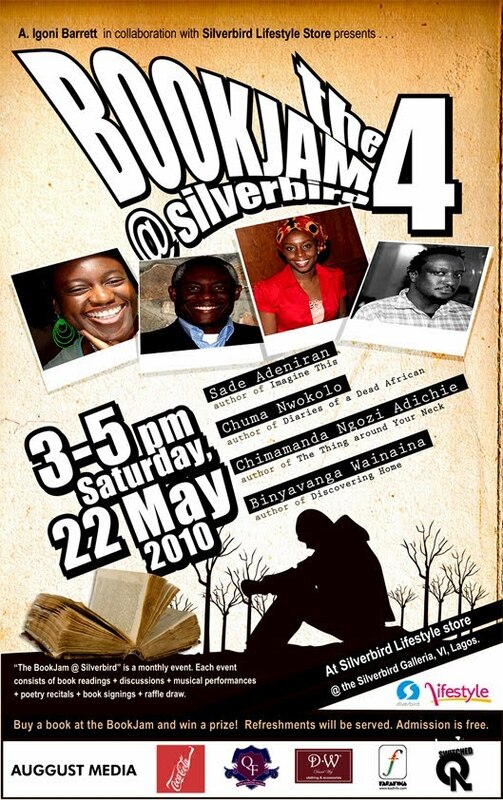 “The BookJam @ Silverbird” is a monthly event that consists of book readings, discussions, musical performances, poetry recitals, book signings and a raffle draw. At each edition of the BookJam you have the chance to meet and discuss with some of our finest writers—and you might win a prize too, if you buy their books. CHUMA NWOKOLO is a lawyer and writer. He was writer-in-residence of the Ashmolean Museum and chair of Leys Newspapers, Oxford. He is the publisher of African Writingmagazine. He has written short stories, novels and poetry. His story, Diary of a Dead African, was chosen by La Internazionale as one of the 3 best stories worldwide in 2003. He lives in the UK. CHIMAMANDA NGOZI ADICHIE is the author of Purple Hibiscus, Half of a Yellow Sun, and The Thing Around Your Neck. Purple Hibiscus won the 2005 Commonwealth Writers Prize (Overall Winner, Best Book) and Half of a Yellow Sunwon the 2007 Orange Broadband Prize for Fiction. Her latest book, The Thing Around Your Neck, was shortlisted for the 2009 John Llewellyn-Rhys Memorial Prize. She lives between Nigeria and the US. BINYAVANGA WAINAINA is the founding editor of the literary magazine Kwani?. He won the Caine Prize for African Writing in 2002 for his story Discovering Home. He is currently a Director at The Chinua Achebe Center for African Writers and Artists, Bard College, Annandale-on-Hudson. His writing has appeared in the New York Times, the Guardian, Granta andNational Geographic. Farafina is proud to support the Legacy project to restore Jaekel House in the Railway Compound located in Ebutte Metta. Many of us have driven past or even inside the Railway Compound only to marvel and wistfully imagine the glory of this wonderful area of Lagos. Railway compound is easily the closest to the tranquility and greenery of Southwest Ikoyi and still has many houses in the same colonial style. However, unlike Ikoyi, Railway has been largely abandoned in the past few years and many of its structure have been left to rot. Legacy decided to take one of the largest properties on the grounds and renovate it beautifully to it’s past glory. The group will be turning Jaekel House into its headquarters and a Mini-Museum of the rich history of the railway grounds. Mini railway museum and Nigeria in transition photographic exhibition, with a short lecture by Prof John Godwin OFR. OBE. 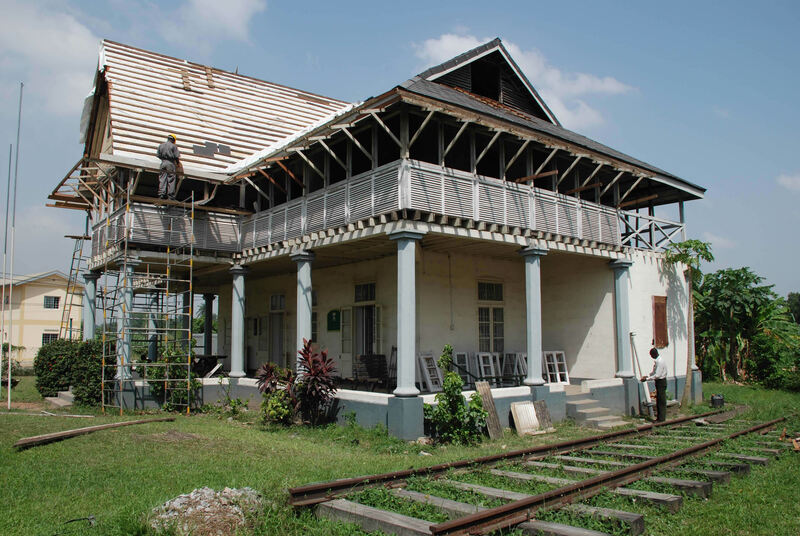 Jaekel house, an over 100 years old example of classic colonial architecture, that once housed the MD of the Railway corporation, has been painstakingly restored by Professor of Architecture John Godwin. You will be able to have a glimpse into the colonial past of Nigeria as you tread the large verandas of this fine structure, with its myriad of windows and louvers, and take in the wonderful photographic exhibitions of “Nigeria in transition” and “The colonial railways”. Prof Godwin shall be there to eloquently elucidate. The railway compound itself is an oasis of tranquillity in the hustle and bustle of the mega city and is only a 15 minute go slow free journey to and from Ikoyi / VI at this time of day. It will certainly be a memorable morning well spent. Handa’s Surprise Named on Best Children’s Book List! Imagine our joy and elation as we read through the Guardian UK Online Books Section (as we usually do) and we see that one of our favorites “Handa’s Surprise” by Eileen Browne, published in Nigeria by Farafina Books, was named on the list of Best Children’s Books Ever in the ages 0-2 category. Of course here at Farafina we always publish the best books we can get our hands on so we’re not so much surprised at this but elated that others are confirming what we’ve known all along! Handa’s Surprise is a story about an African girl called Handa who decided to take a basket of fruits to her friend Akeyo. She spends the time wondering which fruit would be her friend’s favourite but unbeknownst to her, she meets some animals along the way who find the fruits irresistable! It is Handa herself who is surprised at what she finds when she finally reaches her friend. We’re pretty stoked to be participating in the Nigerian International Book Fair (NIBF) once again this year. The fair will run from Monday May 9th, to Saturday May 15, 2010 at the Multipurpose Halls of the University of Lagos Campus in Yaba. The NIBF is the top publishing event in the country and attracts over 100 publishers, bookshops, and other related companies who set up at the book fair to promote their products and the industry at large. Last year the book fair welcomed over 10,000 visitors over the course of one week. Like last year, this year Farafina will be available throughout the course of the fair and we will also be participating in the Buyers & Sellers meeting as well as the Book Marketing workshop. We’d love to meet all of so please stop by stall D24! The Abuja Writers’ Forum (AWF) in collaboration with the Public Affairs Section of the United States Embassy, Abuja will be hosting a one-day creative writing workshop in Abuja on May 15, 2010. You can also visit the Farafina Trust website farafinatrust.org for more info.